Nope, you are not seeing a double post. Last month I reviewed the MINIX NEO X8-H Plus, it was probably my favourite review item to date. The X8-H Plus was a higher end device and came it at a little over £175 with a A2 remote. MINIX have now released a lower end version called the X8 Plus, but what’s the difference. It’s actually fairly simple. The spec that’s going to jump out at you is that the NEO X8-H Plus includes the Amlogic S802-H CPU which supports hardware decoding for Dolby TrueHD and DTS HD Bypass audio formats through HDMI. The Amlogic S802 is the quad-core replacement for the dual-core MX chip found in popular streaming boxes like the G-Box Midnight MX2. 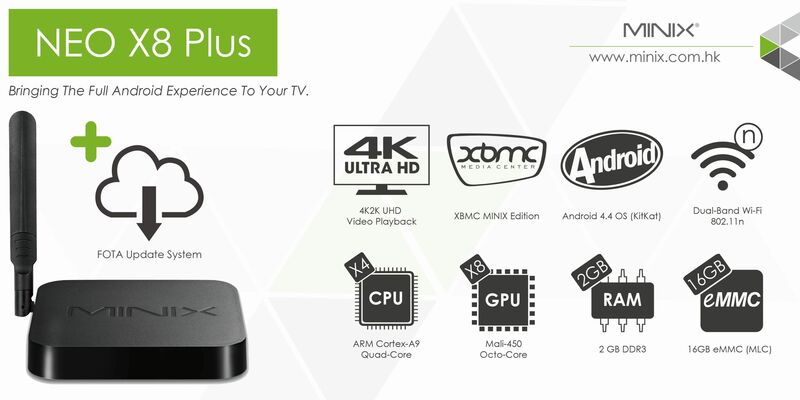 The S802 continues Amlogic’s solid history of XBMC support, but increases performance dramatically. The Plus part of the X8 Plus is the bump on the eMMC, from 8GB to 16GB. Which brings it up alongside the X8-H Plus. The NEO X8 Plus offers support for Ultra High-Definition (UHD) 4K video playback right out of the box. This means you can get an incredibly clear picture, better image texture and less pixelation than on regular high-definition signals. As with the X8-H Plus, the X8 Plus includes a dual band Wi-Fi connection with an external antenna to allow for maximum network stability. MINIX also include a signal analyzer application which will allow you to fine-tune your network to get the best performance. Firmware updates are available Over The Air (OTA), so you don’t need to manually download and install new releases on your own. When you think they can’t include anymore stuff, there is also Bluetooth 4.0 as well. The X8 Plus includes 3 USB 2.0 ports, a wired Ethernet port, an optical audio out, HDMI, two 3.5mm jacks for headphones and microphone, and a micro-USB OTG port. It also supports Ultra High Speed (UHS) SD cards which allow file transfers at up to 104 MB per second. As always the unboxing experience was amazing, MINIX know deisgn, and this shows in the X8 Plus. The casing is matte black, with the MINIX logo in recessed gloss black. The rounded off corners remind me of Apple TV. The X8 Plus comes in at 5 inches square and just over an inch tall – not including the antenna. The antenna will add another 5 inches to the height, so always keep that in mind when setting up your entertainment center. The X8 Plus includes a basic IR Remote. The NEO series includes an internal IR sensor, so you won’t need to string an unsightly wire to the front of your TV. The remote is basic in terms of functionality, it feels good in the hand and works. The buttons have a good solid click to them. 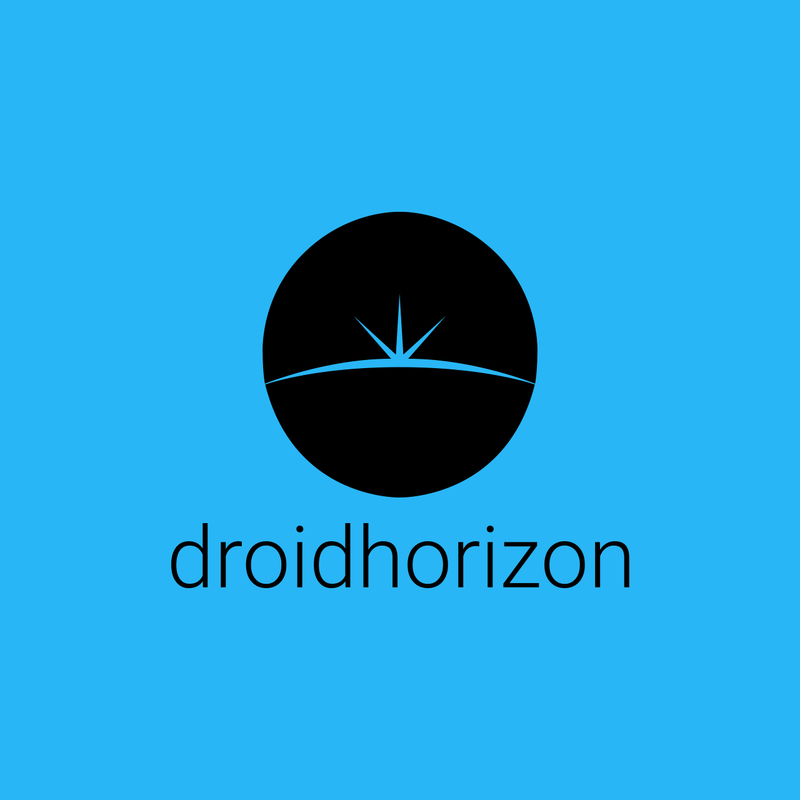 It was built for the boxes Metro launcher, and I did have problems navigating certain apps. There are alternatives, though. The NEO M1, A2 Lite and A2, I highly recommend the A2 Lite, I reviewed it in my X8-H Plus review. With its built in gyroscope and keyboard on the back, its the perfect fit for this box. The included accessories with the MINIX NEO X8 Plus are the basic IR remote, power adapter, dual-band antenna, HDMI cable, micro-USB cable and OTG cable. I have to say I was surprised by the inclusion of the HDMI cable, these can cost around £5, and not a lot of manufacturers include them anymore. Another good guy MINIX move. When you first turn on the MINIX NEO X8 Plus, you’re greeted with a Windows 8\Windows Phone type interface, appropriately called the Metro interface. But as I found its taken all the good bits from Windows and left out all the bad. The NEO X8 Plus played avi, mov, mp4 and mkv files perfectly. There was no loss in picture or sound quality. I thought a good test would be to push it to its limit, so I tried to stream a 2.5GB mkv over my network and play it using XBMC. The large file size, along with the network transfer caused some stuttering in the playback. That was the only downside to an otherwise perfect time using this box. The MINIX NEO X8 Plus comes installed with Android 4.4 KitKat, but upon turning it on, your not greeted by the standard android screen. MINIX included the Metro interface to make it simple for anyone to sit down on their couch and watch movies. Don’t worry, if you don’t like the Metro interface, you can always revert back or install your own launcher. There are predefined folders, where you can separate your favorite apps by category. Everything is quite intuitive. There are several utilities and cool extras included right out of the box, such as the previously mentioned Wi-Fi Analyzer. There is also CloudTV, AirPlay Pro (normally a $5 app), ExpressVPN and SOPCast, just to name a few. MINIX also includes native Miracast support in the NEO X8 Plus. 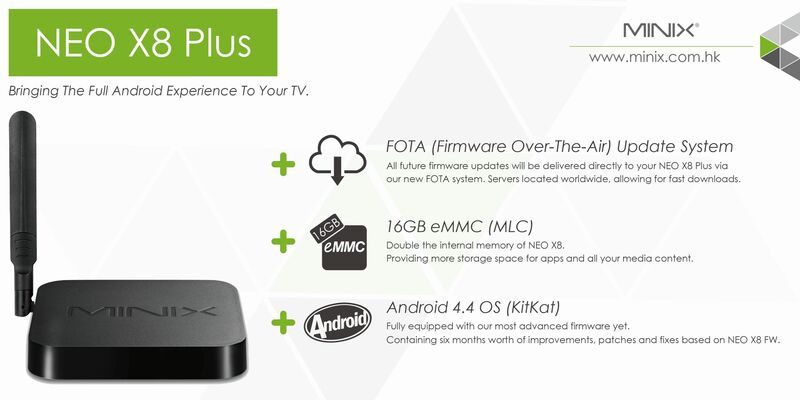 The NEO X8 Plus ships with XBMC 13.3 Gotham. Though this isn’t the version you can just download off the web, this is the 4K XBMC version. The majority of my video testing was done through XBMC and it performed perfectly. I can’t say enough how much I’m loving what MINIX are sending out. The performance is amazing. The Metro interface is powerful and flexible while still being simple enough for my dad to use. It has a sleek matte design that looks like it could be sold with high end 4K TVs. Couple it with the A2 Lite motion-sensing remote and you have the makings of an awesome home entertainment system. Everyone should see the NEO X8 Plus as a cheaper 4K alternative to NEO X8-H Plus, the X8-H Plus is for those who do not require DTS and Dolby Digital audio. 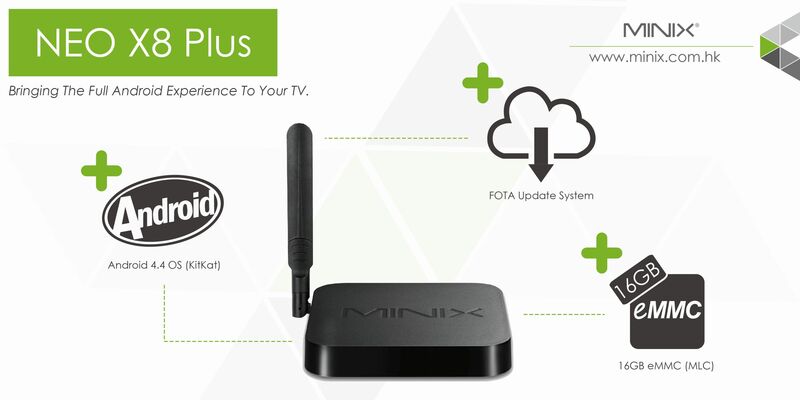 So if you are looking for a stable android TV, that is ready to go out the box, then the MINIX X8 Plus is the one to go for.